Mathis James Reed (September 6, 1925 – August 29, 1976) was an American blues musician and songwriter. 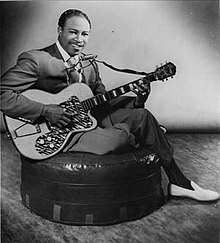 His particular style of electric blues was popular with blues as well as non-blues audiences – Reed's songs such as "Honest I Do" (1957), "Baby What You Want Me to Do" (1960), "Big Boss Man" (1961), and "Bright Lights, Big City" (1961) appeared on both Billboard magazine's rhythm and blues and Hot 100 singles charts. Reed influenced other musicians, such as Elvis Presley, Hank Williams Jr., and the Rolling Stones, who recorded his songs. Music critic Cub Koda describes him as "perhaps the most influential bluesman of all" due to his easily accessible style. Reed was born in Dunleith, Mississippi, in 1925. He learned the harmonica and guitar from his friend Eddie Taylor. After several years of busking and performing there, he moved to Chicago, Illinois, in 1943. He was then drafted into the U.S. Navy and served in World War II. He was discharged in 1945 and returned briefly to Mississippi, marrying his girlfriend, Mary (henceforth known as Mama Reed). He then moved to Gary, Indiana, to work at an Armour meat-packing plant. Mama Reed was an uncredited background singer on many of his recordings, notably the hits "Baby What You Want Me to Do", "Big Boss Man" and "Bright Lights, Big City". By the 1950s, Reed had established himself as a popular musician. He joined the Gary Kings with John Brim and played on the street with Willie Joe Duncan. Reed failed to gain a recording contract with Chess Records, but signed with Vee-Jay Records through Brim's drummer, Albert King. At Vee-Jay, Reed began playing again with Eddie Taylor and soon released "You Don't Have to Go", his first hit record. It was followed by a long string of hit songs. "At his best—on Vee-Jay in the '50s—Reed sang with the languid self-assurance of a man who never ran for the bus because he wanted to spend the fare on a glass of wine, and the unindustrious shuffle rhythms of the Vee-Jay band ambled right along behind." Reed maintained his reputation despite his rampant alcoholism; his wife sometimes had to help him remember the lyrics to his songs while recording. In 1957, Reed developed epilepsy, though the condition was not correctly diagnosed for a long time, as Reed and doctors assumed it was delirium tremens. When Vee-Jay Records closed, his manager signed a contract with the fledgling ABC-Bluesway label, but Reed never produced another hit. In 1968, he toured Europe with the American Folk Blues Festival. Reed died of respiratory failure in 1976, in Oakland, California, eight days short of his 51st birthday. He is interred in the Lincoln Cemetery, in Worth, Illinois. Reed was posthumously inducted into the Blues Hall of Fame in 1980 and the Rock and Roll Hall of Fame in 1991. The Rolling Stones have cited Reed as a major influence on their sound, and their early set lists included Reed's songs "Ain't That Lovin' You Baby", "The Sun Is Shining" (played by the Stones at the 1969 Altamont concert), "Bright Lights, Big City", and "Shame, Shame, Shame". "Little by Little", the B-side of their February 1964 UK hit single "Not Fade Away" was a pastiche of "Shame, Shame, Shame". "Honest I Do" was included on their first album, The Rolling Stones (subtitled England's Newest Hit Makers in America), in 1964 (the U.S. edition also included "Little by Little"). For their 2016 release, Blue & Lonesome, they recorded a version of Reed's "Little Rain". Elvis Presley recorded several of Reed's songs, having a hit with "Big Boss Man" in 1967 and recording several performances of "Baby, What You Want Me to Do" for his 1968 TV program. (Presley's 1964 hit "Ain't That Lovin' You Baby" is a different song from that recorded by Reed.) "Baby, What You Want Me to Do" was also covered by Wishbone Ash on their 1972 album Live Dates and was frequently performed by Etta James as well as Hot Tuna. Johnny and Edgar Winter performed it live in 1975 and included it on their album Together. Omar Kent Dykes and Jimmie Vaughan released the album On the Jimmy Reed Highway as a tribute to Reed. Bill Cosby covered four of Reed's songs, "Bright Lights, Big City", "Big Boss Man", "Hush Hush" and "Aw Shucks, Hush Your Mouth", for his 1967 album, Silver Throat: Bill Cosby Sings. The Steve Miller Band covered five of Reed's songs: "You're So Fine", on the 1968 album Sailor, and "I Wanna Be Loved (But by Only You)", "Big Boss Man", "Caress Me Baby" and "Ain't That Lovin' You Baby", on the 1986 album Living in the 20th Century. Reed's recordings of "Big Boss Man" and "Bright Lights, Big City" are among the "500 Songs That Shaped Rock and Roll" in the Rock and Roll Hall of Fame. Aerosmith played "I Ain't Got You" in live shows, and included it on their 1978 Live! Bootleg album. 1955 "You Don't Have to Go"
1956 "Ain't That Lovin' You Baby"
"Can't Stand to See You Go"
"I'm Gonna Get My Baby"
1959 "I Told You Baby"
1960 "Baby What You Want Me to Do"
1962 "Aw Shucks, Hush Your Mouth"
"I'm Going Upside Your Head"
1966 "Knockin' at Your Door"
"Don't Press Your Luck Woman"
1968 "My Baby Told Me"
1969 "Don't Light My Fire"
b/w "You're Just a Womper Stomper" — — Let the Bossman Speak! ^ a b Russell, Tony (1997). The Blues: From Robert Johnson to Robert Cray. Dubai: Carlton Books. pp. 76–77. ISBN 1-85868-255-X. ^ Whitburn, Joel (1988). Top R&B Singles 1942–1988. Menomonee Falls, Wisconsin: Record Research. pp. 345–346. ISBN 0-89820-068-7. ^ a b c d e Koda, Cub. "Jimmy Reed: Biography". AllMusic. Retrieved August 31, 2015. ^ Doc Rock. "The 1970s". The Dead Rock Stars Club. Retrieved 2015-08-31. ^ Richie Unterberger (1964-05-30). "The Rolling Stones (England's Newest Hit Makers) – The Rolling Stones | Songs, Reviews, Credits". AllMusic. Retrieved 2016-01-10. ^ Fricke, David (December 13, 2016). "Review: The Rolling Stones Reinvigorate the Blues on Blue and Lonesome". Rolling Stone. Rolling Stone. Retrieved 13 December 2016. ^ Bruce Eder. "Having a Rave Up – The Yardbirds: Songs, Reviews, Credits". AllMusic. Retrieved January 10, 2016. ^ "The Animals: Songs". AllMusic. Retrieved February 6, 2018. ^ Jack Rabid. "The Story of Them Featuring Van Morrison – Them: Songs, Reviews, Credits". AllMusic. Retrieved January 10, 2016. ^ Planer, Lindsay. "Grateful Dead (Skull & Roses) – Grateful Dead:; Songs, Reviews, Credits". AllMusic. Retrieved January 10, 2016. ^ "Live Dates – Wishbone Ash | Songs, Reviews, Credits". AllMusic. Retrieved 2016-01-10. ^ Michael B. Smith. "Together – Live – Johnny & Edgar Winter | Songs, Reviews, Credits". AllMusic. Retrieved 2016-01-10. ^ Gilstrap, Andrew. "Popmatters website album review". Popmatters.com. Retrieved 2011-11-13. ^ Ankeny, Jason. "Silver Throat: Bill Cosby Sings – Bill Cosby: Songs, Reviews, Credits". AllMusic.com. Retrieved 2016-01-10. ^ Hanson, Amy. "Sailor – Steve Miller Band: Songs, Reviews, Credits". AllMusic.com. Retrieved 2016-01-10. ^ "Living in the 20th Century – Steve Miller Band: Songs, Reviews, Credits". AllMusic.com. 1987-12-15. Retrieved 2016-01-10. ^ Whitburn, Joel (1996). Top R&B/Hip-Hop Singles: 1942–1995. Record Research. p. 369. ^ Whitburn, Joel (2003). Top Pop Singles 1955–2002. Menomonee Falls, Wisconsin: Record Research. p. 564. ISBN 0-89820-155-1.